Many Syrian commentators are upset on my site because al arabia and al jazeera english web sites did not report of the Pro-Assad demonstration in Damascus yesterday. Regarding coverage, if you don’t allow journalists in, don’t cry wolf when you’re not getting the mediaspace you think you deserve. In any case, this demonstration was a step in the right direction. 2300 m flag representing 23 million people. A show of unity at its core….. The great Syrian flag parade got plenty of coverage in the west — even on my local rag, the Vancouver Sun. As one of our other Canucki-residents, Syrian Almighty Knight, will attest, the flag even got coverage in Quebec — even on the dreadful CBC which was so unkind to Mr Almighty Knight in the past. In Damascus, the regime mounted an orchestrated show of support, when thousands gathered to unfurl a national flag that was 1.6km long. The pro-Assad demonstration along Mezzeh Autostrad in Damascus underlines that the majority of Syrians seem to be sticking by the government’s side. The regime is not only Alawi. Christians and minorities continue to show support for stability. So do many Sunnis. Certainly this is true of the middle class and upper middle class, who have the most to lose if the country trends toward greater civil strife. Their comfortable lives will be destroyed. Mezzeh Autostrad is the center of middle and upper-middle class Syrian society in Damascus. Of course, no one knows what the true percentages of support for either side are. Another factor contributing to the loyalty of the Sunnis for the regime is the wide-spread worry about “foreign conspiracy.” Listen to this recent khutab by al-Buti, Syria’s senior Sunni cleric. He describes the “plan” that “has already begun” to destroy Syria and divide it and turn it into an endless battlefield of attack and counter-attack. The implication is that the US and Israel are behind this plan. The Syrian opposition itself is deeply divided over the notion of foreign intervention. The leadership at the Antalya meeting took a strong and united stand against any foreign intervention. The secular activists who live in the West are, however, trying to drum up support among Western governments for greater and more punishing economic sanctions, such as a blockade on Syrian oil and gas exports. I have asked several Turkish friends if they believe their government might allow a Syrian insurgency to organize and operate from Turkey, particularly if Western government pressure it to do so and offer to pay for it. They all said, “no” and explained that anxiety about the Kurdish situation, possible Syrian support for the PKK, and the fear of getting sucked into a Syrian civil war would preclude this. The most obvious future for Syria is that the present situation continues for much longer than we think it can. The West, exhausted by foreign wars, economic overstretch, and the enormity of taking on Syria, will refuse to commit itself to the rebel cause militarily. All the same, it may add to the economic pressure on Syria by slowly ratcheting up sanctions. Even if the Assad regime can repress the uprising, it is hard to see how it can re-integrate Syria back into the international community and attract tourism and foreign investment again with the growing list of sanctions that have been imposed on it and its top statesmen. The economy is likely to be the government’s Achilles heel. Syria doesn’t have Iraq’s or Libya’s oil, making the economic outlook very different. Bankruptcy could lead to a tipping point, once the government is unable to pay salaries, etc…. Could growing economic pressure lead the nation’s elites to abandon the regime? This is clearly the hope of the opposition. The train system has been shut down. It was deemed too dangerous to travel on as it stops at too many stations. Traveling by car is also very hard. Flying between Aleppo and Damascus is now the only form of travel that most people are comfortable with. With Aleppo residents shunning nonessential travel, Latakia’s hotels are offering steep discounts to lure vacationers. A large duplex which was priced at syp 13,000 a night last year is now to be had for syp 1800 on a special offer. The Meridian in Lattakia has an offer for syp 2000 a night with breakfast. Given that the conflict reached Maaret Al nuaman (40 minute drive), the residents of Aleppo feel that things have moved closer to home. The check points at the entrance to the city now experience delays of up to 45 minutes at times as cars wait for their turn to be checked. Women avoid venturing out alone past 6 pm. Only restaurants inside the city are seeing business. Those located on the outskirts have seen a significant hit as most residens prefer to stay away from such locations at night. There have been a number of small attempts to start anti government marches. Other residents and the security services have quickly moved to disperse any small crowds before they grow in size. A christian gentleman that we both know was due to get married on July 9th, but he was caught last month after having written online against the regime. After he was questioned and released, he resumed his writings. He was arrested again last week and is yet to be released. His wedding is now in serious doubt. BRUSSELS -(Dow Jones)- The European Union is set to adopt a third round of sanctions on Syria over the government’s crackdown on protesters there in time for the June 24European Council, EU diplomats said Thursday. The new sanctions push comes at a time when the EU and U.S. have been seeking to ratchet up pressure on Syria through the United Nations Security Council but have seen their efforts stymied by Russia, among others. At least two countries have circulated a list of names to be targeted, diplomats said. One list includes 12 individuals and firms or other entities connected to them…. However no decision is expected to be made until EU heads of government gather for the quarterly European Council on Friday. The EU has already slapped a travel ban and an asset freeze on 23 top Syrian officials, including President Bashar Al-Assad. (PTI) — UN chief Ban Ki-moon today urged Syrian President Bashar al-Assad’s regime “to stop killing people,” as pressure mounted on Damascus over its widening crackdown in the north. TIME speaks to a colonel who says he defected from the Assad regime after seeing its forces allegedly open fire indiscriminately on fleeing citizens ….. the 22-year military veteran says he burned his uniform in disgust more than a week ago, …. “I defected from the Syrian Arab army and took responsibility for protecting civilians in Jisr al-Shoughour,” he says. “I was late in taking this decision.” His lower lip quivers. He struggles to maintain his composure. After a long pause and several deep breaths, the man with the thinning salt-and-pepper hair resumes: “I feel like I am responsible for the deaths of every single martyr in Syria.” …. ….Unlike Egypt, where the urban upper-middle class played a major role in bringing down Mubarek, many of Syria’s urban-dwellers have experienced improvements in their standard of living in recent years. In the countryside, most of the population has experienced rapidly increasing fuel and food prices, drought and falling living standards. As a result of liberalization, Syrian markets have been flooded with foreign goods and that has made manufacturing less profitable. The poor in smaller towns have been driving the protest movement as the result of economic pressures and it was these sections of the population that Assad sought to win over when in April he announced higher wages for civil servants, new jobs, more subsidies, and the creation of a social fund. has declined and so has demand in the economy. In order to pay higher wages and cover the cost of higher salaries without new sources of income, the government has announced it will increase the state budget deficit. The apparent end of liberalization means that structural problems will persist. With the root causes of Syria’s economic malaise not dealt with and no prospect of significant capital inflows, it is hard to know how economic growth can be restarted…. Syria could by the end of the year be forced to look for outside aid to keep its economy afloat, analysts warn, as the country reels from three months of protests and a huge military crackdown. As troops advanced on the northern town of Maarat al-Numan on Tuesday, observers increasingly questioned the health of Syrian finances. With the tourism sector devastated by the unrest, foreign investment on pause and government spending rising to help ease the discontent, analysts say foreign exchange reserves at the central bank are being depleted as the government tries to stem pressure on the local currency. The Syrian pound slipped about 15 per cent against the dollar in April and sells for less than the official rate on the black market. “The reserves are certainly doing a lot of work propping up the Syrian pound but the exact level of depletion since the crisis began is impossible to say,” says a western analyst in Damascus. High oil prices have boosted revenue from Syria’s limited oil exports, which, combined with a relatively good year for agriculture after several seasons of drought, may prevent dramatic economic contraction. Oil revenues bring in an estimated $7m-$8m a day. Opposition figures say they would like companies to stop buying Syrian oil to raise economic pressure on the regime. But the combination of lower revenues from other parts of the economy and the additional spending burden means Syria “could run out of money”, according to Chris Phillips, chief Syria analyst at the Economist Intelligence Unit. Analysts say the regime could survive on foreign reserves and domestic bank lending for a while – one of the lower estimates is six months – but would then probably have to turn to oil-rich Gulf countries for help. Whether they would come to the rescue is uncertain. Opposition figures say Qatar, one of Syria’s closest friends in the Gulf, has been distancing itself from the regime. But both the United Arab Emirates and Saudi Arabia appear afraid of giving up on President Bashar al-Assad for fear of an unknown alternative. Tour operators say hotel occupancy in Aleppo and Damascus is close to zero. The unrest has slowed trade and disrupted manufacturing. Meanwhile, the regime has overstretched itself on spending commitments in efforts to quell the unrest. Before the crisis broke out this year the regime had wanted to reduce fuel subsidies and liberalise the state-led economic model. But after the unrest in the region began, the regime decided to raise heating oil allowances, diesel subsidies and civil servants’ salaries, and cut food taxes. Even with optimistic growth forecasts, the budget deficit is likely to be 7.7 per cent – almost double the 2009 figure. Syria is not well connected to international lending markets and domestic banks have limited capital. Cutting spending seems politically unfeasible, international investment seems to be on hold, and printing money risks hyperinflation. “Their only option will be to raise capital from foreign (sovereign) lenders,” says a western analyst in Damascus. Mohammed al-Jleilati, the minister of finance, insisted last week that the economy was “strong and healthy”, claiming Syria was self-reliant in food and sitting on foreign currency reserves worth $18bn. However, according to Mr Phillips, “the goal at the moment seems to be stay in power whatever the costs, the costs to both the population and the economy”. Though their views differ, Arab states are all worried, angry and actively monitoring the current crisis in Syria. What we are hearing and monitoring, about many victims falling, indicates great tumult in Syria … The situation in Syria should not be left in this state. Continuation of the status quo could lead to what may not be desired … for Syria. Syria’s representative to the league, Youssef Ahmadm described Moussa’s comments as “unbalanced” and politically motivated. Days before leaving his post Moussa calls for a kind of foreign intervention in the Syrian affairs, when the Libyan blood, shed by Nato air strikes as a result for a [UN] security council resolution, based, regrettably on an Arab demand in which Moussa’s efforts immensely contributed, isn’t dry yet. 9.23am: Syria’s sectarian tensions in Jisr al-Shughour and beyond are mapped out by the New York Times’s Beirut bureau chief, Anthony Shadid. Syrian officials have suggested that militant Islamists have manipulated popular grievances and warned that the government’s collapse would endanger the relative security of Christians and other minorities there. Opposition activists have played down sectarian divisions, which they describe as a government ploy to sustain its four decades of rule. If anything, they say, the government has stoked tensions in a cynical bid to divide and rule. A Syrian official inquiry into deaths among anti-government protesters has barred two top officials from going abroad, one of them a cousin of President Bashar al-Assad, state media said on Monday. Ateb Najib, a cousin of the president and head of security in Daraa, where protests against the government erupted in mid-March and Faisal Kulthum, the town’s former governor, were both banned from foreign travel. “Immunity is not accorded to those who commit crimes and… The law must be applied,” state media quoted the commission of inquiry as saying. change should take place safely over a number of years, not quickly! Turkey obviously has an agenda and the regime must keep some distance in the future. Only Syria can save the Middle East, if Syria falls we lose the Middle East. The Syrian colonel sits cross-legged on a patch of moist soil, wearing a borrowed plaid shirt and pale green trousers, surrounded by dozens of men who had fled the besieged northern Syrian city of Jisr al-Shoughour to an orchard a few hundred meters from the Turkish border. He says his name is Hussein Harmoush and shows TIME a laminated military ID card indicating his name and title. Everyone around calls him moqadam — Arabic for his rank. A colonel with the 11th Armored Division of the army’s 3rd Corps, the 22-year military veteran says he burned his uniform in disgust more than a week ago, starting with the rank designated on his epaulets, then the rest of it. “I defected from the Syrian Arab army and took responsibility for protecting civilians in Jisr al-Shoughour,” he says. “I was late in taking this decision.” His lower lip quivers. He struggles to maintain his composure. After a long pause and several deep breaths, the man with the thinning salt-and-pepper hair resumes: “I feel like I am responsible for the deaths of every single martyr in Syria.”…. 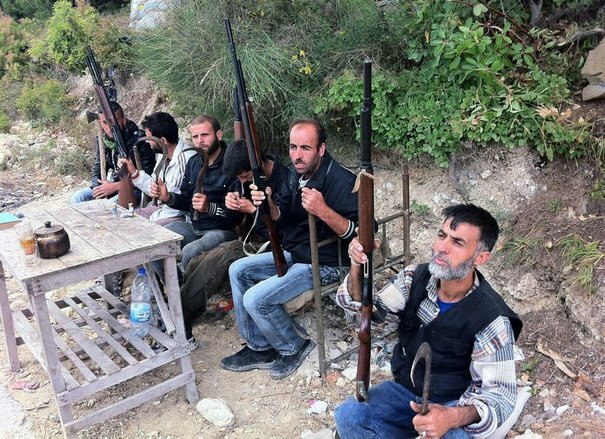 For the past few days, Harmoush and a handful of his men have been helping residents of Jisr al-Shoughour trek across the hills toward the safety of the Turkish border. His own family is now safely in Turkey. He won’t divulge whether he still has his weapon, nor if there are other defectors among the refugees in the fields, although many residents say there are. Harmoush is grateful for the opportunity to help his people but is haunted by some of the atrocities he says he has witnessed committed by the Syrian security forces. By Ayla Albayrak in Istanbul and Nour Malas in Abu Dhabi Turkey’s Prime Minister Recep Tayyip Erdogan pressed Syrian leader Bashar al-Assad to put an end to violence Tuesday, in the two leaders’ first telephone conversation since their once-close relations appeared to sour a week ago. The phone call came as Syria’s military extended its crackdown to new cities and as refugees continued to cross the country’s northern border into Turkey. There were 8,500 Syrians in Turkish camps as of Tuesday afternoon, Turkey’s Deputy Prime Minister Cemil Cicek said in televised remarks. Mr. Cicek said Syria’s increasingly isolated leader had initiated the phone call to congratulate Mr. Erdogan on his party’s victory in elections Sunday. There is growing concern that the religious tensions sparked by the Syrian uprising will be imported into this part of Turkey which has a delicate demographic balance between Sunnis, Alevis and Christians. the Turkish government began to ease a block on media access to the refugees, a policy that had prevented most refugees from giving their accounts of what is happening in Syria. A foreign ministry official said the government must protect refugees’ identities, or they could be harmed on their return to Syria. I translate video clips of the current protests, demonstrations and other videos related to them. The link below leads to a youtube “channel” I created (thesyrianinterpreter), and to which I upload & re-upload protests’ videos (42 translated vids so far). Then, I add English subtitles to them, to the clips/videos I think ‘everyone’ should be able to understand. Syria’s opposition is stepping up its lobbying efforts to secure a tougher international stance against the Damascus regime and encourage army officers to join the pro-democracy movement. After visiting London this week a delegation of opposition figures is set to hold meetings in Russia, a friend of the Syrian regime that has blocked a UN Security Council resolution condemning the brutal crackdown against the three-month uprising, and Turkey, which the opposition sees as the best place to launch an initiative that could accelerate a political transition. While Libya’s rebels were quick to attract international intervention, and even Yemen’s popular revolt drew Gulf neighbours in with a mediation plan, Syrians have essentially found themselves on their own. Opposition activists say they know no one will intervene militarily, even if western officials describe the crackdown as savage and barbaric. But Syrian protesters have also been deprived of support from Arab states, most of which are staying on the sidelines, afraid of what might follow the possible demise of President Bashar al-Assad. Syria’s opposition faces an uphill battle on several fronts. Activists leading the lobbying delegation say they are realistic, both about the credibility they have yet to impose and about their own goals. The Syrian uprising has been leaderless, with protests organised by activists and students in local communities that are only now connecting with each other and unifying their messages and slogans. Many organisers have been jailed and others have been forced to go underground. Until a few weeks ago there was no such thing as a Syrian opposition. The Muslim Brotherhood, the Islamist group that is thought to still have sympathy on the ground, was destroyed in the 1980s by Mr Assad’s father and has only regrouped abroad since then. Beyond the Islamists, there are a few nationalist and leftist parties with little popular support, a Kurdish minority divided into more than a dozen parties, and a disparate collection of human rights and political activists. As protests have spread in Syria, opposition activists abroad have been trying to unify their ranks, and have so far organised two conferences financed by sympathetic businessmen, and elected a 31-member council that includes the Brotherhood and the Kurds. Some of those members are now leading the lobbying effort, though they openly say they are not leaders of the opposition. Najib Ghadbian, a Syrian academic at the University of Arkansas, says the council is co-ordinating with two main committees that have emerged inside Syria and is trying to agree a representative local leadership. Like others in the opposition, Mr Ghadbian says there is no magic solution for Syria: the regime will go only if it fractures from within. Cracks have appeared in the lower ranks of the military but not yet reached a senior military or diplomatic figure. Isn’t that a stretch? really!!! The protesters demonstrations are, most of the time, confined to their respective neighborhoods.you will see 10 separate demos in Homs for example in 10 different neighborhoods. While pro government can benefit from shuttling people from everywhere to Mezzah. The average home in Mezzah is north of $500,000 do you really think that all those who showed up are only mezzah residents? I can tell from the pictures that many are low-level employees and Mukhabarat folks. Your conclusions hold so much naivety.. More like an orientalist. “…as the slaughter of Christians continued in the Chouf, the Christians of Beirut were being systematically disarmed by the Turkish police. Muslims, on the other hand being joined and encouraged by the Druze were allowed to carry their arms. On the 24th June a mob of 400 began to shout that the time had come to murder the Christians. The Christians of Baalbeck were killed, their property pillaged, their houses and churches burnt. By the end of June the Druze had destroyed 300 villages leaving 80,000 Christian refugees to depend on charity for their daily bread. From Lebanon, the spark flew towards Damascus leading to the deaths of thousands of Christians there. Alas, just by reading the news of what’s going on in Iraq and Egypt will give to the Syrian regime only one answer: keep an iron fist. Egyptian newspapers report on kidnappings (the 12 years old grand-niece of Sadate, etc.) and gives advice such as: don’t trust anyone, usually kidnappers are either people working for you or even some relatives. So i can imagine that indeed the ultra-rich Syrian happy fews are not going to abandon the regime any time soon. Instead, the talk of the day is on yet another ghost, al-Zawahiri. It’s rather ridiculous that people will believe in armed militants in Iraq, Lebanon, Jordan, Palestine, Israel, Pakistan, Afghanistan, Yemen, Saudi Arabia… basically, everywhere EXCEPT Syria, because the media tells to believe it. It’s just like how people actually believed that Israel was honestly defending itself from boats carrying food and medicine to Gaza. It’s as if Syria is on a different planet where criminals don’t exist except in the government. In fact, I bet if FOX News ran a story saying that Syria was on Mars, many people would actually believe it because they’re too stupid to find it on a map. Likewise, it is very comical from the Islamist-supporting crowd, hearing them say that if the country let foreign reporters in, the lies would not run in the media. It’s as if it suddenly becomes OK to lie. They tend to forget that other countries that DID let reporters in, were lied about. And then what happens when Syria DOES let reporters in? A whole new set of excuses come out. We are all with you ya Bashar. Syria will be a better place inshallah as we are all one under the Syrian flag no matter what your religion, mazhab or anything else. KULLNA MA3AK YA BASHAR, not because we worship anything else than God (or whatever your religion), but because we have faith in you to bring freedom and islah (reform) to our country. ALLAH SURIYYA, AL SHA3B W BASS. Typical hopeful and vicious thinking from a zionist who wants us to forget the massacre the Jewish terrorists did, not in 1861, but between 1948 and now. Why don’t you enjoy your economically successful apartheid paranocracy and forget about Syria and the Arabs. We certainly don’t need more parasites, the only “scared shitless” are people of your own kind. I could tell it was a fake when I first heard it. Yet another fabrication by the silly so-called “opposition”. إن “الحقيقة” ، وإذ تندد بهذا السلوك الوضيع والقذر في فبركة الأشرطة والأخبار عن سابق إصرار وتصميم من قبل من يدعون مناصرتهم لانتفاضة الشعب السوري ، تشير إلى أن هؤلاء أصبحوا وجها آخر للإعلام السوري الذي يشهّرون به ويعيبون عليه. وقد لاحظنا أن “الحقيقة” أصبحت مؤخرا هدفا لأشرطة من هذا النوع ، سواء من جهات محسوبة على المعارضة أو السلطة .. فقط من أجل ضرب مصداقيتها . وهي تعتذر في الآن نفسه على أنها لم تبذل جهدا كافيا لتدقيق الشريط. نعيد ونذكر بمقولتنا الدائمة : من يطرح نفسه بديلا للسلطة عليه أن يكون بديلا أخلاقيا لها قبل أن يكون بديلا سياسيا. ومن لا يستطيع أن يكون كذلك” يروح ينقبر ويقعد في بيته “! Let’s just agree that both sides enjoy sufficient popular support. It is not healthy to act as the biased inspectors of you tube videos that we all are. There is no sufficient popular support for the opposition. أفاد معارض سوري، لوكالة «يونايتد برس انترناشونال» أن آلاف المسلحين المجهزين بأعتدة عسكرية حديثة ينتشرون حالياً في جبل الزاوية ومعرة النعمان وأريحا بمحافظة إدلب وفي قرى على الحدود السورية ـــــ التركية»، مشيراً إلى أنهم «مجهزون بصواريخ مضادة للدبابات وأسلحة فردية قادرة على اختراق السترات الواقية من الرصاص، ولا يمثلون أياً من الأحزاب المعارضة وينتمون إلى تيار أصولي». وقال المصدر المعارض إن الجيش السوري الذي يستعد لتنفيذ عملية عسكرية في المنطقة «سيواجه مقاومة عنيفة من الجماعات المسلحة بسبب وعورة الأماكن التي تنتشر فيها». ميدانياً، ذكر رئيس المرصد السوري لحقوق الإنسان رامي عبد الرحمن لوكالة «فرانس برس» أن الجيش السوري بدأ نشر قواته على مداخل مدينة خان شيخون التابعة لمحافظة إدلب (شمال غرب) مع استمرار الحملة العسكرية والأمنية التي بدأها في ريف مدينة إدلب، لافتاً إلى أن «القوات السورية قطعت الطريق الدولي المؤدي من حلب (شمال) إلى دمشق، وذلك بدءاً من مدينة سراقب (ريف إدلب)». كذلك أشار عبد الرحمن إلى أن «عدة مدن سورية شهدت أول من أمس تظاهرات ليلية، أبرزها في حماة، حيث تظاهر عشرات الآلاف»، فيما تحدث الناشط مصطفى أوسو إلى وكالة «أسوشييتد برس» عن حملة اعتقالات واسعة تنفذها السلطات في منطقة جسر الشغور، معرة النعمان، والمناطق المحيطة بها لكل من يتجاوز 16 عاماً، مشيراً إلى أن معدل الاعتقالات اليومية يبلغ 300 شخص. وبينما يستعد معارضو النظام السوري للمشاركة في جمعة «صالح العلي» تأكيداً لنبذ الطائفية، في إشارة إلى المكانة التاريخية التي يحتلها الشيخ العلوي، بصفته أحد قادة الثورة السورية ضد الفرنسيين، واصل النظام حملته العسكرية في محيط منطقة جسر الشغور، فيما سجل تطور لافت بتأكيد دبلوماسي غربي مقيم في دمشق، من خلال وكالة «رويترز»، تشجيع العديد من الدول الغربية لانقلاب عسكري في سوريا. وأكد الدبلوماسي الغربي الذي رفض الكشف عن اسمه لـ«رويترز» أن المجتمع الدولي يرى أن «مرحلة ما بعد (الرئيس بشار) الأسد ميسّرة على نحو مثالي من خلال انقلاب عسكري»، مؤكداً أن «عدة حكومات تشجّع الجنرالات السوريين على التمرد». وأضاف «نحن نعزل الأسد وأسرته، ونحن نخاطب القادة العسكريين وأعضاء مجلس الوزراء للانتفاض. نحن نشجّع الجنرالات على الانتفاض». في موازاة ذلك، دانت المتحدثة باسم الخارجية الأميركية فكتوريا نالاند، اليوم، «اللجوء الفاضح الى العنف» من جانب السلطات السورية في التعامل مع الاحتجاجات الشعبية، مطالبة بوضع حدّ فوري له. في المقابل، تستمر موسكو وبكين بإصدار المواقف المؤكدة لرفض تشديد الضغوط على سوريا، بعدما أعلن الرئيسان الروسي ديمتري مدفيديف والصيني هو جينتاو في بيان مشترك، أن «في وسع الأسرة الدولية تقديم مساعدة بنّاءة لمنع تدهور الوضع، غير أنه ينبغي ألا تتدخل أي قوة خارجية في الشؤون الداخلية لدول المنطقة» العربية. أما على الجانب التركي، حيث واصل مبعوث الرئيس السوري الخاص اللواء حسن توركماني لقاءاته في العاصمة التركية أنقرة، فقد أفادت وكالة أنباء الأناضول بأن داوود أوغلو وتوركماني اجتمعا لمدة أربع ساعات، لكن لم تصدر أي تصريحات بعد اللقاء، فيما التقى داوود أوغلو سفراء أنقرة في الشرق الأوسط والولايات المتحدة وبعض دول الاتحاد الأوروبي لمناقشة الوضع في سوريا والسياسة في المنطقة. وعلى صعيد متّصل، قال النائب عن حزب العدالة والتنمية الحاكم، نابي أوجي، وهو مستشار سابق لرئيس الوزراء التركي رجب طيب أردوغان، إن تركيا مستاءة من ردّ سوريا على طلبها التوقف عن استخدام العنف ضد المدنيين والبدء بتنفيذ إصلاحات، مشيراً إلى أن «ردّ النظام السوري حتى الآن مؤسف وغير مفيد ومحبط». ورداً على سؤال عن إمكان فرض الجيش التركي منطقة عازلة في الأراضي السورية لحماية المدنيين، قال إن تركيا لا تعتزم التدخل العسكري في سوريا، لكنه قال إن تركيا ذكّرت الحكومة السورية دوماً بأن التدخل قد يصبح جزءاً من أجندة للمجتمع الدولي، وحثّت دمشق على اتخاذ خيارات عقلانية. BBC announces that Rami Makhloof is withdrawing from business to concentrate on charities: Too little too late? ” I guess he believes that by repeating them over and over, it will become accepted as the truth . That is usually the approach used by religious extremists including Israelis..
Rather than attacking the messenger, try to respond to the message. Now this is more a Zionist strategy. I can tell you with same breath, that you and few others are obsessed by labeling this uprising as an Islamic one. It is not. Once you shoot civilian, torture and apprehend them, and turn them into refugees inside their homeland or abroad, you are no longer a legitimate entity. But to deny the protesters their right, by demonizing them, does not sound right. ask yourselves ,What’s the aim from such movies fabrication? do we have CIA and Mossad in the official and other makhloufian media too? Can Revlun or Shami post tomorrow’s clips? “I will not engage in any new projects that can generate personal gain and I will devote myself to charity and humanitarian work,” Makhlouf said in the statement. I agree with your statement, not at all with Joshua’s. Joshua needs a crash course on what a middle or upper middle class is in syria + a real estate price list. It will serve him well. Syria no Kandahar ,what do you think of the clips i posted above ? We are your eternal neighbors Akh No Kandahar ,bashar can not last against our will for ever. I only see from menhebak that asad-makhlouf regime is of divine nature asad family are eternal winners and we are eternal losers,this is irrational behavior. It seems that the ego of Bashar was not satisfied with the flag show. Nour according your sources ,Wasnt he expected to speak to the nation the day after the flag show ? They’re not my sources. I post news that I think is interesting. Other sources are now saying he will speak on Monday. In any case, a speech by the President would be an interesting news item, to say the least. Majhool ,as an aleppine ,i can tell you that the upper and upper middle classes districts in Aleppo do not contain more than 2 % -3 % of the total population,for example al Shahba district is nearly empty of people and most of those rich insult bashar when they are with relatives and close friends inspite their links with local corrupt intermediate(hassoun,shami,hamida,berri),the mukhabarat and other army officers associate. (those so called warriors against zionism consider Aleppo as the Kuwait of Syria,the damascene rich class is less corruptible i heard). The middle class is dying ,it likes to buy expensive phones but is exhausted. Yes under the current context ,they see themselves obliged to be associated with the security apparatuses and military people but in reality ,they hate them more than anybody else. They are all waiting ,the natural political change over that is inescapable. In fact ,those look towards Saudi Arabia ,for economic expension perspective ,i dont think they will be still liked by menhebak people after the road turns. You obviously don’t read my posts. I don’t want to keep repeating what I wrote… Just look at one of my posts and show me any post where I said it was an islamic one. You seem to believe that anyone who does not label this uprising as a revolution to get rid of Bashar al Assad is labeling it as ‘islamic’. Rami Makhlouf: Too little , too late? “On Thursday, Davutoğlu conducted a four-hour meeting with Hasan Turkmani, al-Assad’s special envoy, to demand that Damascus take action to halt its military campaign to crush protests and launch immediate and substantial reforms that would placate international anger. “Our meeting was fruitful and comprehensive. It was a meeting that mutual confidence has come to realize. I hope all we discussed will be actualized and that the tension will decrease. A comprehensive reform process toward democratization guaranteed by Bashar al-Assad … should be implemented,” Davutoğlu said. We want a strong Syria and want Syria to initiate a comprehensive reforms process to achieve this. In order to achieve this, violence must stop immediately,” Davutoğlu said. Not everything discussed is released to the media. I thought that Bashar was supposed to make a speech to the nation, what is going on? The meeting in Ankara,did not go well,at all. If the regime changed he will loose everything. I think HA has to consider the road going back. Allegedly threatened by Syria, Hariri Jr prefers to stay in his luxurious appartment in Paris and leave his 14 March group without a leader. Why doesn’t he imitate Rami Makhlouf? ANB reported that he will be speaking Monday. I agree, but Davutoglu has not renewed publicly Erdogan’s harsh words of last week. As I wrote before, Turkey will probably back off of attacking Syria verbally. Turkey has too much at stake, economically and politically, if they antagonize more Bashar Al Assad. At the same time Turkey is under intense pressure from the US to stop the Gaza flotilla and restart a better relation with Israel. This is an opportunity to analyze opinions of a sample of Syrian youths who have applied for Syrian Youth Parliament, an NGO for sharing and proposing ideas, strategies and plans, it has been slowed at this stage, and they wanted to share their views on Road Map to save Syria …. Documents showing Syrian regime behind Golan protests fake. Nobody checks the information published here not the least the commentators who in their majority are not interested in the truth but are interested from both sides by spreading propaganda. What I meant is that Turkmani went there to show them certain things and present to them certain facts. The fact that it was Turkmani that was sent means that the discussions included certain security matters to which the Turks were made aware. I’m sure this has something to do with their change in tone. The wider web of deceit behind gay girl in Damascus (the juicy distraction). On the class issue, I am really tired of the orientalist point of view. let’s be scientific for once. Working class/lower middle class: Month to month. always short on money. Middle Class: Has to work for a living. Usually carries a mortgage. Rich, don’t need to work at all. Poor: less than a dollar a day 25% maybe? The way i see it, the middle class Josh is talking about is in reality an upper middle class that does not constitute more than 20% in totality. that's 5 million people. which correlate well with the population of better neighborhoods of all major Syrian cities combined. and not all are pro-regime. Some syrians want Bashar to stay as long as he wants to,most want elections and term limits . Some syrians want a regime collapse now,most syrians want gradual and peaceful reform. Some syrians want an Islamist state,most syrians do not. Some syrians want foreign intervention,most syrians do not. Syrians agree on one thing: the Syria they love has to change. Alarabiya electronic edition has nothing on Syria at this moment !! It is good sometimes to be ignored . I hope we do not have a bloody Friday tomorrow. The army will take days to secure jabal alzawiya. Some citizens from aljisr have actually started to go back,we want them all back with dignity. Rami is talking nice but nobody believes him anymore. Syriatel shares must be sold to the public at a big discount , syrians were robbed by syriatel and the government was part of it. When honorable people fail, they accept responsibility and bow out with humility. The party that got us to where we are now can do the honorable thing and allow syria to change in a peaceful and orderly fashion. They have what it takes to do that. “لا يمكن أحداً يعرف التجارب السياسية الكبرى، إلاّ أن يتّعظ بفشل التجربة التي يمثلها حزب البعث العربي الاشتراكي، نظراً وعملاً، ثقافةً وسياسة. إنها الجزء الأكثر بروزاً ودلالة في فشل التجربة الحزبية الإيديولوجية برمتها في العالم العربي. فهذه الإيديولوجية لم تخنق الفكر وحده، وإنما كادت أن تخنق حركية الإنسان وحركية المجتمع. Alex,the non blind follower of asad you could be,i would like to ask you and answer me in the name of your dignity :do you really believe that this regime is capable to resign itself to the choice of a political change through a democratic transition which would need to give up their iranian theocratic style propaganda of personality cult and divinization of thefamily members ? What do you think of these clips that were presented as the big proof ? do they hold enough crediblity in your eyes in order to repeat mini hama in all parts of Syria? According to your conscience :Is there a possibility to discuss with these menhebak icons ? “The train system has been shut down…too dangerous to travel on as it stops at too many stations. Traveling by car is also very hard. Flying between Aleppo and Damascus is now the only form of travel that most people are comfortable with. Latakia’s hotels are offering steep discounts to lure vacationers. A large duplex which was priced at syp 13,000 a night last year is now to be had for syp 1800. The links you post at the end of your messages are getting old. You are trying to send a message of hate. If your position is that Arabs were and are Nazi like people just say it yourself. Do not be a wimp. I have more respect for the deranged Syrian Knight than I do for you because he speaks his mind. Instead of inciting hate, you should work on your society problems because you have many. Change has to be very drastic. The majority of the people want that. The best way to prove me wrong is to have free elections. The key is “honorable people”. It seems to me none exists in the current government. How come the other side is not allowed freely into the streets? I saw kids demonstrating for master Bashar yesterday. How come you didn’t condemn these parents? 20% is way too high of a number. Anyone who makes more than $200K (which is upper middle class and above) in the US is considered in the top 3% of earners. Hope the baby still smiling? I put 20% only because many of them were expats and brought money from the gulf. they own a home or two and able to sustain their lives with very little income ( since the home is already paid for).. I had better things to learn, read, write and work on than repeating myself to people pretending to show that they care of other Syrians’ children while they don’t. 1.President Bashar in fact has over 80% of Syrian population support. 2.80% of supporters consist of, Muslims and Christians. 5.June 17th foreign media reported Mass anti government rallies took place, but opted to use a pro Assad rally photo & short video clip, It’s logical to assume you would use photos & video Clips of the Anti government protest, this means either, the anti government protest didn’t take place or it was to small to broadcast. The answer is, It was to small to broadcast. You should not overestimate the size of the pro-regime rally that took place in Mezzeh last Wednesday. I went there as an observer and my impression is that there was much less people that what you could imagine by seeing the pictures on TV. In fact, the flag was quite large and was taking the whole space, so that there were only two rows of people from both sides…seen from above, it gives the illusion the Autostrade was crowded from Ommeyades to Al Baath Newspaper, but if you would have taken off the flag, the rally would have been much shorter. By the way, I think that the fact that the rally took place in Mezzeh does not mean that it was a middle-class or upper-class event. In happened in Mezzeh Autostrade because it was the only street dowtown Damascus large and long enough to deploy the flag. A lot of young people there: at least for them, it was apparently more a good opportunity to celebrate the end of the exams than to show their unconditional love to Assad. Rami Makhlouf is putting in beau-coups of money to try and bolster the Syrian economy, amongst his proposed projects are charities. I think the Syrians, or at least my husband’s family here in Damascus, are not at all upset by the notion. Not so too little too late.